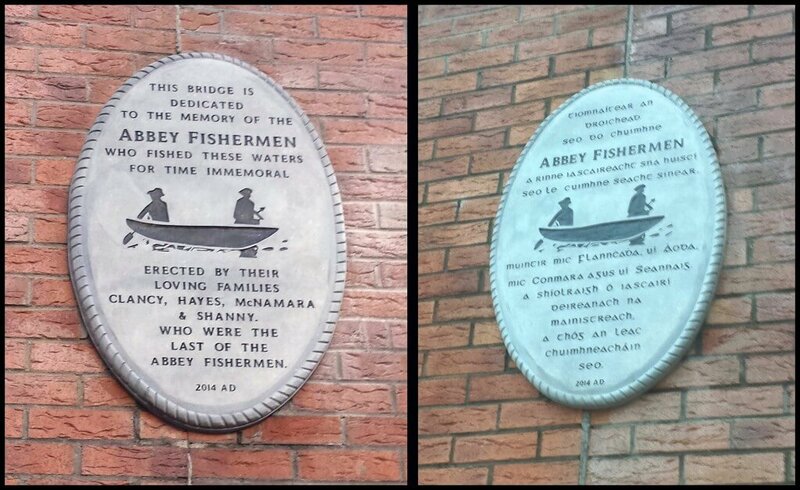 The traditional Limerick city fishing community the “Abbey Fishermen” will now be remembered for posterity as their families have erected a memorial on the Abbey Bridge. These men fished the Shannon river for centuries and lived primarily in the Park and Abbey areas, which is where their name came from. Today their surviving relatives came together to make the visible memorial a reality, with the permission and advice of Limerick City and County Council. The memorial consists of two limestone plaques, on opposite sides of the bridge, inscribed both in English and Irish ‘this bridge is dedicated to the memory of the Abbey fishermen who fished these waters for time immemorial’. It also stated ‘erected by their loving families Clancy, Hayes, McNamara and Shanny who were the last of the Abbey fishermen’. To highlight their skill the plaque includes a sketch of a Brecaun, the traditional fishing boat, and two fishermen with paddles in it. Ger Hayes, a descendant of the fishermen, told the Post that “the memorial wouldn’t have become a reality without the help and hard work of the people who marched and protested to have the bridge named the Abbey Bridge”. He said the Council were very supportive of the memorial project and the committee of which he was a member “did tremendous work”. The other members of the committee were Marie O Flaherty nee Clancy, Sharon Slater, Charlie Clancy, Anthony McNamara and John Shanny. He wanted to thank Cllr. John Gilligan also advised and supported the project, and Joe Marsh Memorial, Ballysimon for engraving the plaques. 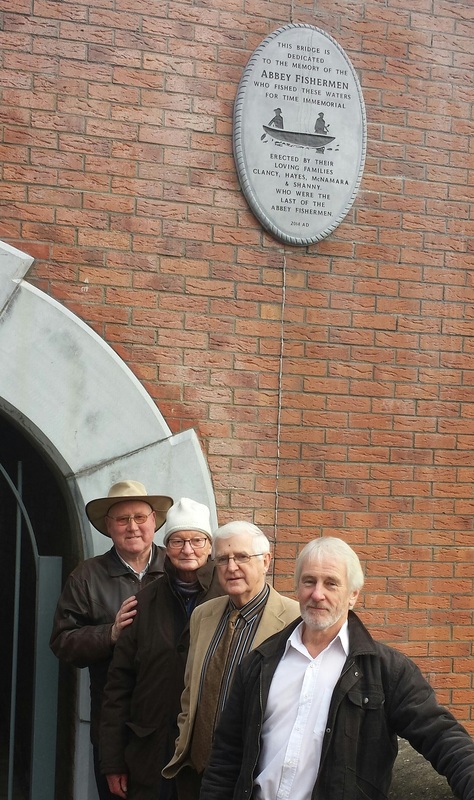 The idea for the memorial came out of the Gathering concept when descendants of the Abbey fishermen from at home and abroad came together for a May Bank holiday weekend of nostalgia in the Parish area of the city in 2013. According to Ger Hayes among those who attended where people who were never in Ireland before. The four families recorded were the last of the fishermen, other family long gone names of Abbey fishermen were Cherry, O Dwyer, Lyddy, Hartigan, O Connor and Carroll. The tradition of the Abbey fishermen did not die quietly, the construction of the ESB generating station at Ardnacrusha spelled the end for these unique fishermen. In 1932 during a protest on the Shannon their nets and boats were confiscated this became known as the “Battle of the Tailrace” which is now part of folklore. 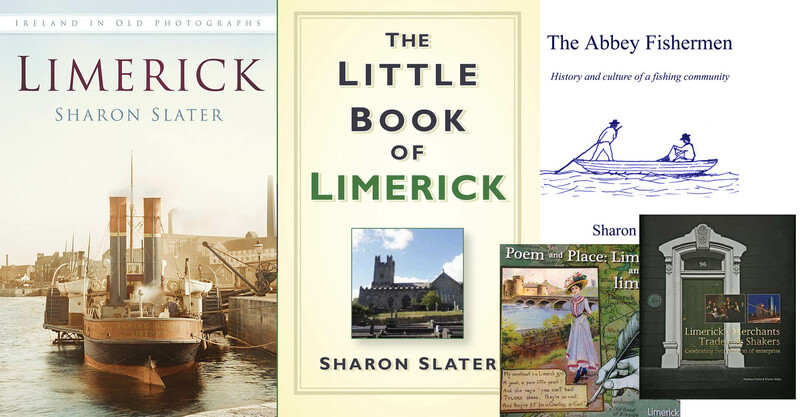 The last fisherman has long since passed but they are still remembered by their families and as long as the Abbey Bridge stands they will be remembered by Limerick.